Check our online calendar to stay in the know about events happening in your community! Check back here for constantly updated details about events happening in your community this year! Students at Buchanan School have been learning about the importance of clean water across Canada as part of a school-wide project called “Water Is Everyone’s Responsibility.” This educational journey is cumulating in a “story paddle” fundraising auction – and LWF has been chosen as one of the water charities who will receive the profits! A variety of people have shared their artistic talents with the school: from friends and family to local community members. Each decorated paddle has a design as unique as the story behind it. Just imagine how amazing one of these works of art would look hanging on the wall of your cottage! 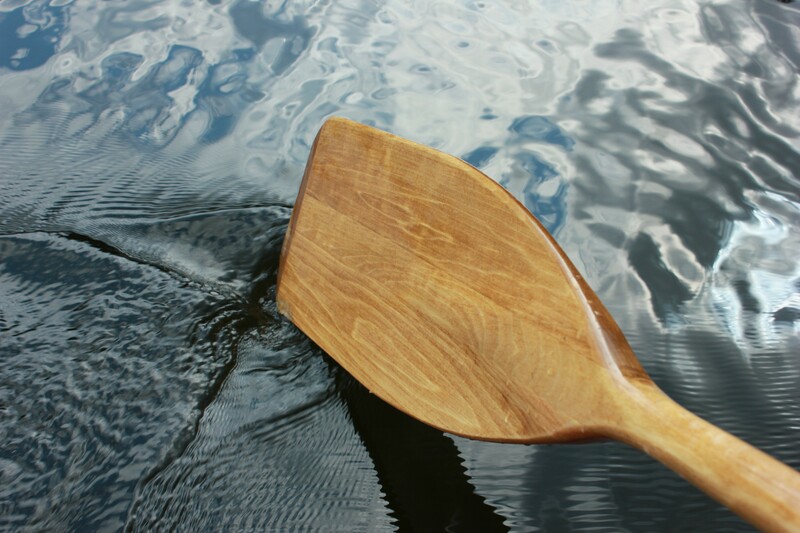 Click here to learn more about this initiative, view paddles currently up for auction and make a bid. Thank you so much to Buchanan School for including us in this creative fundraiser! Update: Due to safety concerns regarding ice conditions as a result of warmer-than-usual weather, the class was unable to go fishing - for now. They are now planning to go fishing in the spring and incoporate a shoreline clean-up, too! We'll post more details as they become available. Thanks to all the lake-lovers who have already supported these eager students! Students from Calvin Christian Collegiate’s Outdoor Education class are getting involved in solutions by getting outside and doing something they love. 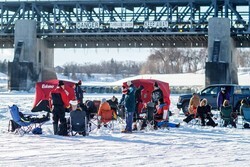 On Thursday Feb. 23rd, they’re heading out ice fishing on the Red River to raise awareness about the need to deal with point sources of phosphorus in the rivers that flow into Lake Winnipeg – and to raise funds for LWF! All money raised will support of Action 3 of the Lake Winnipeg Health Plan, Setting the standard for wastewater treatment. Click here to donate online and support these young water champions! Creative nature photography has been a longtime hobby of Ken Liwiski. Now, he’s using his passion to raise awareness and funds for causes important to him – including LWF! The Kenman Foundation offers a selection of images and poem prints for home and office wall décor, available for the cost of production plus a charitable donation (suggested amount $200). Many of Ken’s shots showcase the beauty found throughout Lake Winnipeg’s watershed and LWF is honoured to be one of the organizations supported through this newly launched charitable photographic art initiative. 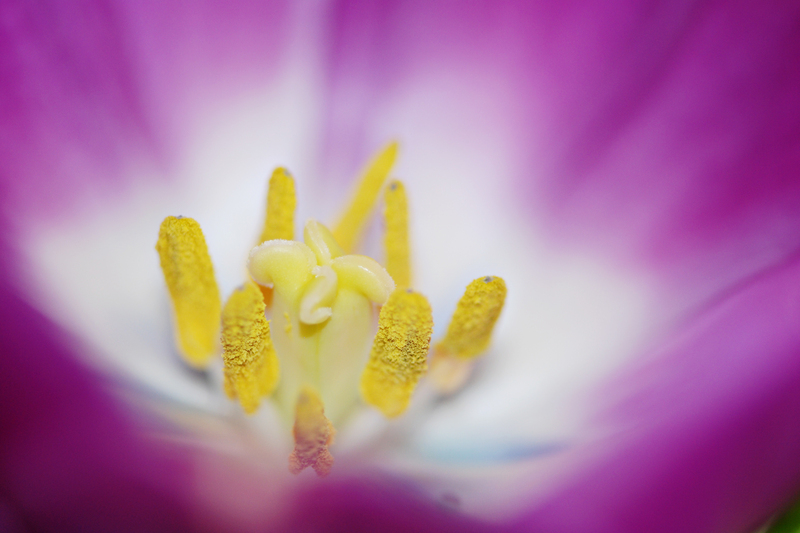 Click here to view his portfolio and order one of his unique images! 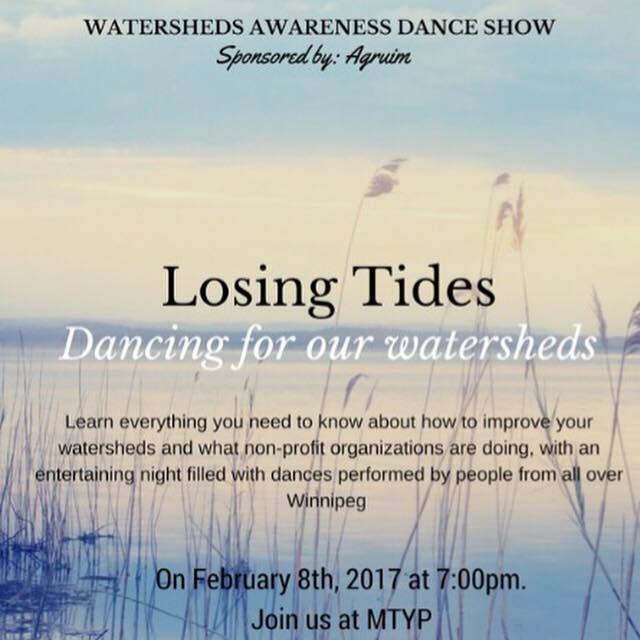 Produced by two Winnipeg Grade 12 students, this charity dance show aims to raise awareness about watersheds across Canada. Taking place on Wednesday Feb. 8 at Manitoba Theatre for Young People, featured dance styles will include jazz, tap, aerial, hip hop, contemporary and more! All proceeds raised will donated to several non-profit organizations – including LWF! We’ll also be set up in the lobby all night; make sure you stop by before, after or during intermission to say hello and learn more about our work. Thank you so much, Hunter and Alissa, for including LWF in what will surely be an unforgettable night! Below, you'll find just some of the creative ways lake-lovers have used their talents to support LWF over the years. After spending the entire 2015/16 school year learning about water, the young water champions at Strathmillan Elementary School put their education into action by organizing a rain barrel sale in support of LWF and a healthy Lake Winnipeg. Winnipeg brewery Barn Hammer Brewing Company chose LWF to be the inaugural recipient of its now-monthly Barn Raising Charitable Initiative, in which partial proceeds from all glasses of beer and growler fills sold in its taproom on a selected day are donated to a local charity. The good folks at Saffies General Store have generously supported us over the years in many creative ways. In 2016, they outdid themselves by hosting an amazing live concert and a delicious (and competitive!) community pie auction! Winnipeg high-school student Marcus Matheson supported solutions for Lake Winnipeg by creating and selling unique art pieces, planters and home décor items – most of which were made from recycled/upcycled materials! Inspired by “the beauty and the tragedy” of Lake Winnipeg, Winnipeg Beach visual artist Gayle Halliwell accepted donations for LWF over the course this 2016 exhibit’s run at Winnipeg’s Cre8ery Gallery, as well as during a subsequent exhibit in Selkirk. Siblings Milo and Cohen and their cousin Breann spend their summers at Grand Marais and Grand Beach. In 2016, they formed a club called Heal the Lake Kids and began taking action, making and selling their own natural weed killer, bug spray and other lake-friendly products, and donate 50% of all profits raised to LWF! A group of talented students from St. John’s-Ravenscourt School wrote and recorded a song, and created their own music video which they posted to YouTube in 2014 to raise funds for LWF! Room 9, a Grade 5 class at Lord Nelson School, sold handmade phosphate-free, microbeads-free and fragrance-free soap – and donate a portion of the profits to LWF! This creative group hosted their popular winter sale in Winnipeg’s Exchange District in 2015 – and donated a portion of all admission collected over two days to LWF! Thank you so much to everyone involved with this event! The talented artists at Osborne Village Ink donated 50 per cent of all proceeds from tattoo repairs booked in August 2013. Grand Marais school teacher Jay Hawranik created this Lake-a-thon endurance event, paddling from Gimli to Grand Beach (nearly 25 km!) in July 2013, on his stand-up paddleboard. SUP Beaches Mind, Body Surf & more! This 2016 Grand Beach event had little something for everyone – from yoga and stand-up paddleboarding to bocci ball and bubble soccer! Equally as great, a portion of all proceeds was donated to LWF! Winnipeg orthodontist Dr. Tim Dumore and his team have created a rewards points program called “Timbucks” for young patients who demonstrate proper oral care. Patients have the option of using these points to donate to the Lake Winnipeg Foundation. Brodie Quinton started this enterprising project to clean up Victoria Beach. Teaming up with volunteers and some employees, Brodie’s fleet of bicycles collect recycling from cottagers and donate two-thirds of all money earned through the program to LWF. Corydon Chiropractic Center created this August, 2013 event, led by yoga instructor Kristen Mitteness on the Winnipeg Art Gallery’s rooftop.